Within 24 hours there will be an increase in humidity, and a drop in temperature. Within 24 hours wind speed, or direction, can usually be altered. Within 3 to 5 days rain is possible; within 5 to 10 days it’s expectable. More land has been affected by wildfires in recent years than at anytime in the last 50 years. Due to increasing climate change in large areas and excessive fuels throughout our forest systems, this trend is more likely to continue than not. Despite the best efforts of fire-fighters on the ground and in the air, an old saying remains true: How does the Forest Service put out a fire? It pours money on it till it rains. In fact, major forest fires are impossible to put out under the conditions that led to them beginning in the first place. Excessive dryness, low humidity, winds, create a fire too large to extinguish and efforts then are only focused on containment, if possible, and protection of homes and property, if possible. But until the conditions that existed when the fire started change, there’s not much more fire-fighters can do. Rainmaking operations become firefighting operations when dealing with a major outbreak. First off, because the weather is dynamic and the atmosphere is producing many different states at once – low pressure here, high pressure there, cool moist air masses in one, hot dry in another – it is possible to draw a flow of cooler, moister air into a region from another region. This causes a noticeable increase in humidity and a decrease in temperatures – both welcomed greatly by firefighters – usually within a 24 hour period. If the winds are harsh and erratic, even wide containment of the fire is difficult. As the flow of cooler, moister air from the other region arrives, the winds generally lie down and become more steady in their direction – again, greatly welcomed in fire fighting. So within a 24 to 48 hour time frame the elements driving the fire calm down, conditions for actually fighting the fire improve, and then containment and extinguishing it become realistic. Ideally, we would like to help a rainfall within 3 to 5 days, and sometimes that’s possible. But much of the West is normally quite dry during the fire season. Under most circumstances, we’ve been able to help some rain fall within a week to 10 days. This is good for putting out the burning fires, of course, but also “sets back” for several weeks or more conditions for another fire to start. A striking, and tragic, example of what could be done, but isn’t, took place this year when fires began in the Southern California area on October 20. Extremely dry conditions throughout the region due to prolonged drought coupled with record level Santa Ana winds blowing out of the Great Basin desert to the east, created the “Perfect Storm” fire conditions and over the next three days fires spread, grew and eventually burned down massive amounts of personal property and large areas of land. Had we been called to the area when the fires started, the first operation would have been to calm the Santa Ana winds. Given the presence of a low pressure center just off the Southern California coast (whose rotation “off the coast” contributed to the force of the Santa Ana ’s) an onshore flow could be developed within a day, if now within some hours. Such an onshore flow would have buffered the Santa Ana ’s, increased the humidity considerably, and dropped the temperatures. Instead, the winds blew ferocious and erratic, the humidity dropped into the single digits and the temperatures rose into the 90’s for over four days. Despite thousands and thousands of firefighters and millions and millions of dollars spent, the fires raged and raged virtually unchecked, until the winds lessened. Only then did actual containment and extinguishing begin. 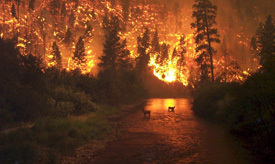 A similar fire occurred in Southern California in the fall of 2003. Again, extremely dry conditions caused by ongoing drought – which Southern California is susceptible to – merged with strong Santa Ana winds and ended up burning across San Diego County for two weeks, killing 22 people, destroying 3,640 homes and blackening 1,200 square miles of land. On the date of this article, February 23, 2003, Southern California was coming out of another dry winter with little prospects for needed rains in the coming spring and summer. Of the Sunday edition in which this article appeared, some millions of people in the region saw it. These people included farmers and ranchers, foresters, environmentalists, water managers, and a host of others who livelihoods cause them to have direct experience with the effects of rainfall, or lack of it. And yet none of them called. None of them wrote, even though the article clearly stated that the rainmakers lived in Northern California and worked often in that half of the state (where the winter of 2003 was quite wet). Despite the extensive, positive publicity generated by the article, no one even inquired if help was available for that drought stricken area. And six months later large areas of it burned to the ground. This year, it happened again. Given the climate changes going on, which seem to be drying the American southwest out even more than it already is, Southern California will see massive fires again. That’s a given. What isn’t a given is how severe and devastating they have to be. It is, as with drought, possible to lessen the severity of forest fires, to alter the weather conditions under which they start and make the fires more manageable, if not put them out entirely.